Located in the rolling western foothills of the Arbuckle Mountains in Southern Oklahoma. 90 minutes from Okc, 2 hrs from Dallas. The property and included residence is very secluded. In summer no man made light source can be seen from the residence. Two small towns, Healdton and Elmore City are both 17 miles distant in opposite directions. Gas and Family Dollar, 5 miles away in Ratliff City. Fenced and cross fenced for cattle production. Two small ponds and a stream for water source. Approximately 50/50 timber and grass. The timber is largely white oak. Grass is a mix of native grasses and burmuda. The largest opening clear of timber is 8 acres (fenced). The rest is a mix of natural grassy openings within timber with a hodge podge of winding trails that I have mowed annually or as needed. The nature of the trails, elevation changes, and terrain allow for an unlimited number of hunting setups for deer, turkey, hogs and predators. several trophy deer have come out of this property. There is some limited surface rock. No public road borders this property, and every entrance is locked. 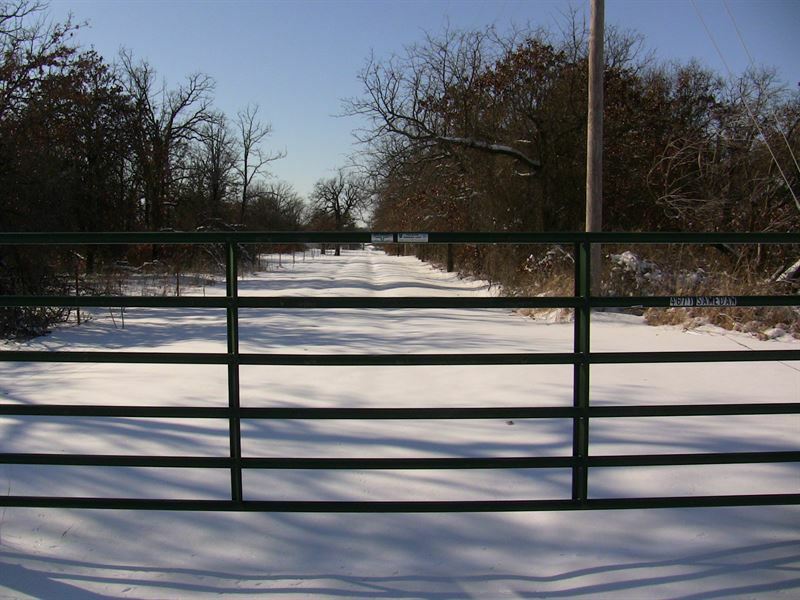 An all weather lease road (behind locked gate) leads to the center of the property and is maintained by the owner. The included residence is on the NE corner of the quarter section, accessed via a 600 ft all weather easment road, lined with Crepe Myrtles (see pics). Built n 1980, the house is 1500 sq ft, of modern construction. It is 2 bedroom ( can easily be converted to 3 bd, by adding a single wall that was left out during original construction, creating a 30 ft long livng room). Amenneties include: new well pump, New Kitchen stove, and over stove Microwave. New Kitchen counter top, back splash, LED lighting,new window blinds, Central Heat and Air (heat pump). The house faces east, and the east porch is shaded by one of the tallest Oaks on the property. The west end of the house has a 12' X 30' shaded deck. During summer, no man made light can be seen in any direction from the house. Night skies, when bright and clear, the milky way often clearly visible. A spacious cart port and an oversize one car garage with cabinets and counter top along the north wall (24 ' est). Utility Room is in a covered breezeway between house and garage. There is also a 20 x 24 out building, same construction as the home. Is currently being used for storage, but could be converted to guest quarters, or a workshop (is framed for a roll up door. Extremely well insulated with 6 inch walls, the former owners used the space for raise parakeets for the wholesale trade many years. The structure is open inside, containing no interor walls.